We are very grateful to Steve Jones of Llanrhaeadr and his Sector 39 team, including Grace Maycock and Ritchie Stephenson, for setting our Ugandan colleagues on the path of permaculture. Growing trees and crops using permaculture principles is ideal for small-holder farmers in Uganda to maximise yields while nurturing the soil. Their first permaculture design training course in May 2016, which our colleagues attended, focussed on the 28 acre land at Kamuli. The second course in May 2107 had 25 participants, mainly teachers, project workers, NGO staff, farmers and outreach workers from across the regions and age groups of Uganda and Kenya. Course participants work with some of the poorest and most excluded sectors of the population, including HIV orphans, war children and self-sufficient rural farmers. It was a tremendously enjoyable and energizing two weeks. 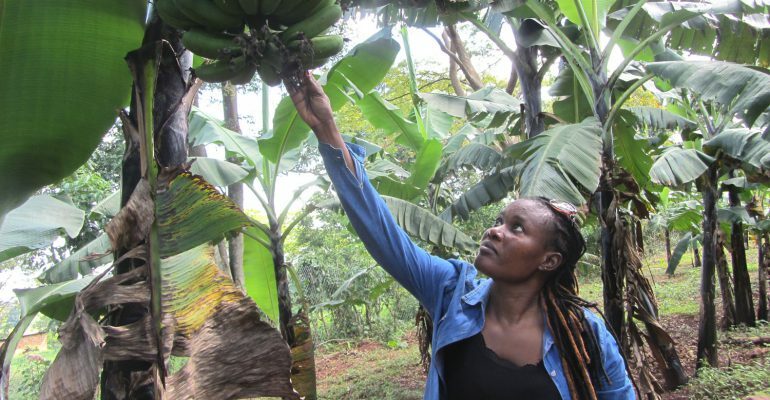 They designed a permaculture garden of many trees and crops at Busoga High School linked with Llanfyllin High School, which Connie Kauma and a student team are tending. Sector 39 is also pioneering a schools permaculture programme at Llanfyllin High School, called “One School, One Planet” and is directed at alleviating climate change at a local level. We strongly support this and would encourage everyone to do what they can in their own locality to address environmental issues and climate change. Charles Mugarura, director of Broadfield Enterprises Uganda, Permaculture Group, which is partnered with the Permaculture Research Institute of Uganda, has agreed to assist at all stages of our permaculture developments in Kamuli and Ngora, which will be of great benefit to them.